Police have confirmed that the Thursday morning shooting in downtown Cincinnati left four people dead, including the gunman. This marks the deadliest mass shooting in the region since 2013. Police chief Eliot Isaac said the shooter opened fire at the loading dock of the Fifth Third Bank Building, and then went into the bank lobby and exchanged gunfire with responding police officers. It is not as clear at this point how the still unidentified shooter was killed as there were initial conflicting accounts. The motive for the shooting has yet to be established. City officials said no officers were injured. 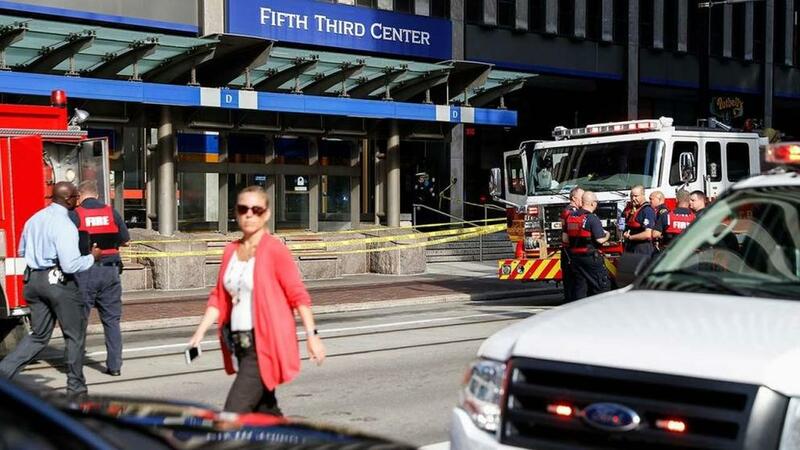 The Fifth Third Center was under lockdown until about 11:20 a.m. The Cincinnati office of the FBI sent agents to the scene to assist local police with the situation. Hospital officials said three men and one woman were brought to the University of Cincinnati Medical Center. Two have died at the hospital, one is in critical condition and one is in serious condition. Officials also said each of the victims suffered gunshot wounds. Other witnesses also shared what they saw. In a country where they Stone people to death! Q said to be vigilent! The motive is unclear? Getting quick cash sounds like a likely motive? Just so happened that his plan derailed almost immediately due to the diligence & courage of our law enforcement professionals. Sad that innocent lives were lost but at least the criminal cannot hurt anyone else again. why no pic of the suspect? Name of hot female detective please. there is a reason why they are not describing the shooter beyond "brown pants and white shirt". is he an illegal alien by chance or a dindu? As we get closer to Major Federal Grand Jury discoveries of the Liberal Political Corruption and Illegal activities during the 2008-2016 attempted socialists era . I expect to see more Headline grabbing distractions some even staged and coordinated.